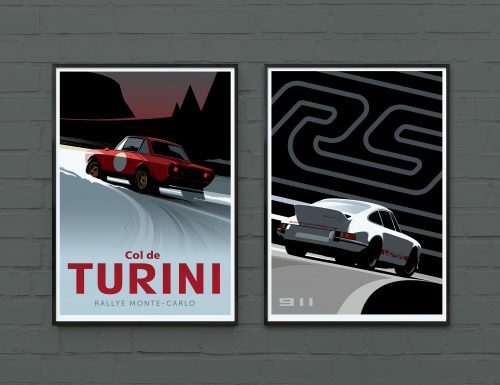 Guy Allen is an artist we’ve loved working with over the past year, and we’re happy to announce the addition of two more posters to our collection of his work in the Shop. 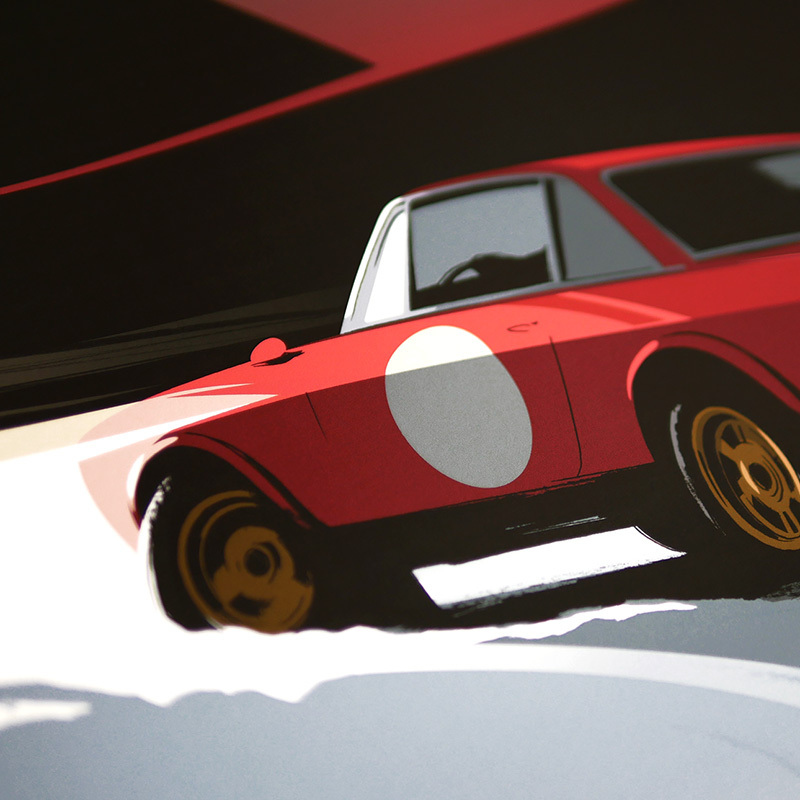 His approach to automotive art sees him covering all manner of important cars and race tracks, and the latest continue this theme with the infamous Porsche 911 Carrera RS 2.7 and the Monte-Carlo-winning Lancia Fulvia 1.6 HF. 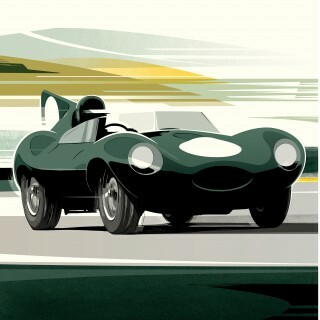 His style isn’t quite fully minimalist, nor is it lush with detail. 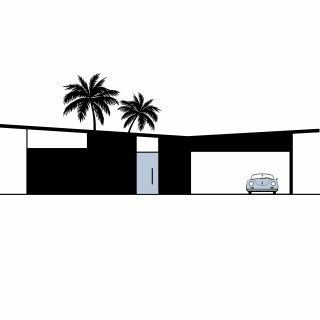 Each piece contains only the necessary elements to convey the scene. 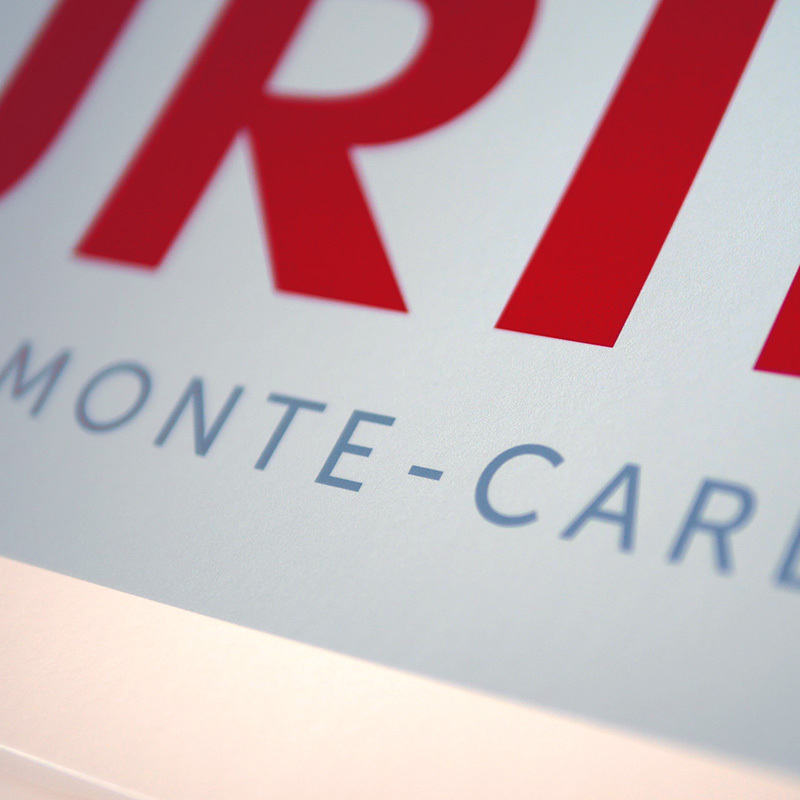 This can be the bokeh of headlights cutting through the night on the Mulsanne, or in the case below, a few peaks and a slice of blank space to represent the road twisting up and into the mountain range ahead. 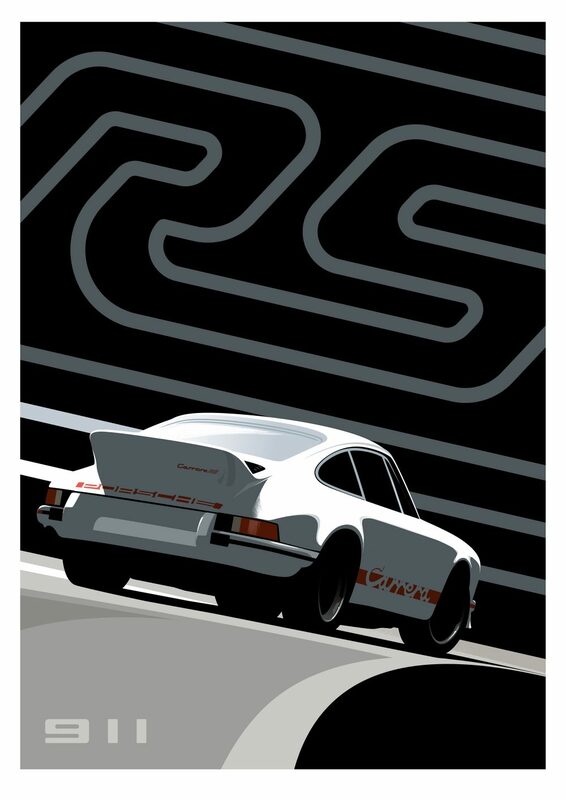 Not everything is set in a discrete place like Le Mans or the Col de Turini though, and the wide-hipped granddaddy RS below shows off Guy’s blank-slate competence in graphic design—no specific setting here to guide the way. More information on each of these prints is below. A climbing, twisting headlamp-lit road ahead, and just a few more ruts carved into the mangled snow behind. 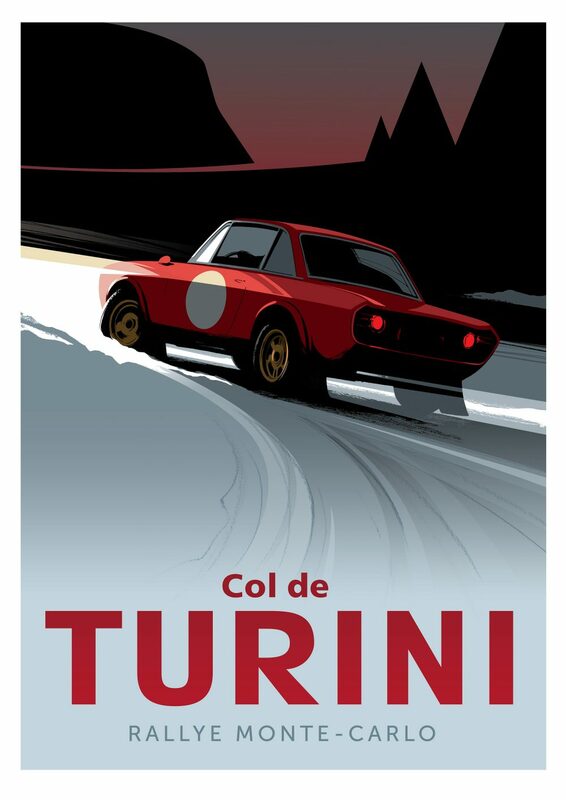 The Col de Turini is the most famous stage in what is arguably the most famous rally in the world, and the route that cuts through the impressive elevation of the French Alps is run under the cover of night, only adding to the treacherous conditions that result from a combination of snow, ice, and technical hairpins. 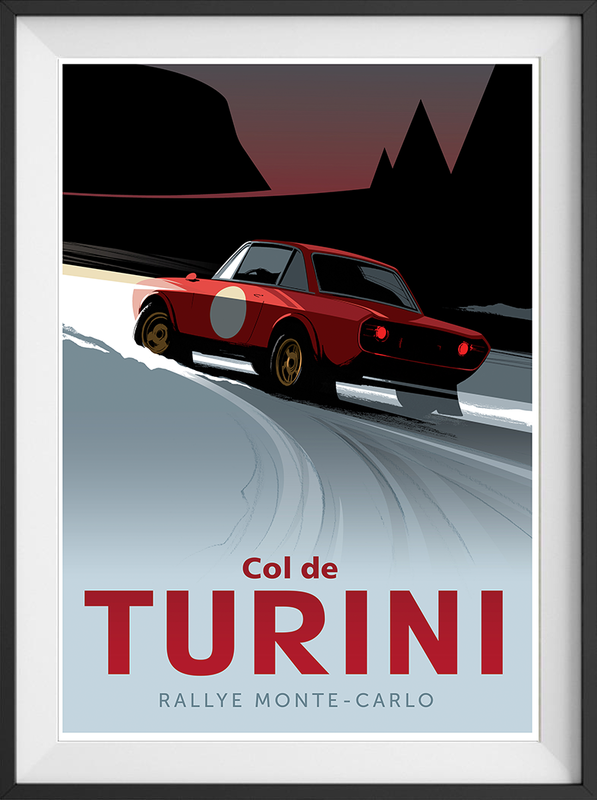 It’s a mettle-tester if there ever was one, and to claim victory on “The Night of Turini” is almost as important as the overall rallye’s results. 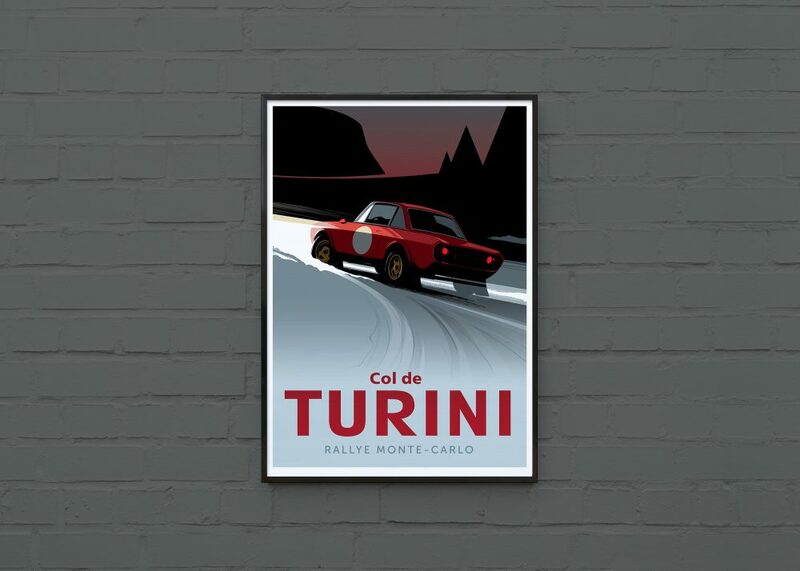 This poster depicts the winners of the 1972 Rallye Monte-Carlo, Sandro Munari and Mario Manucci—as they navigate the wintry covering of the mountain pass in their Lancia Fulvia 1.6 HF. 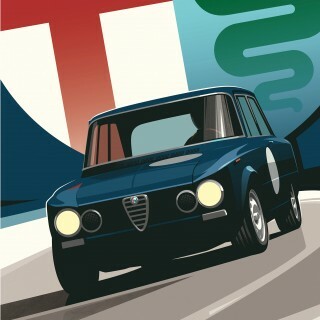 The artwork itself is a masterful example of balance, with the impact sans-serif font complementing the stark lines and squared-off creases of the little Lancia. 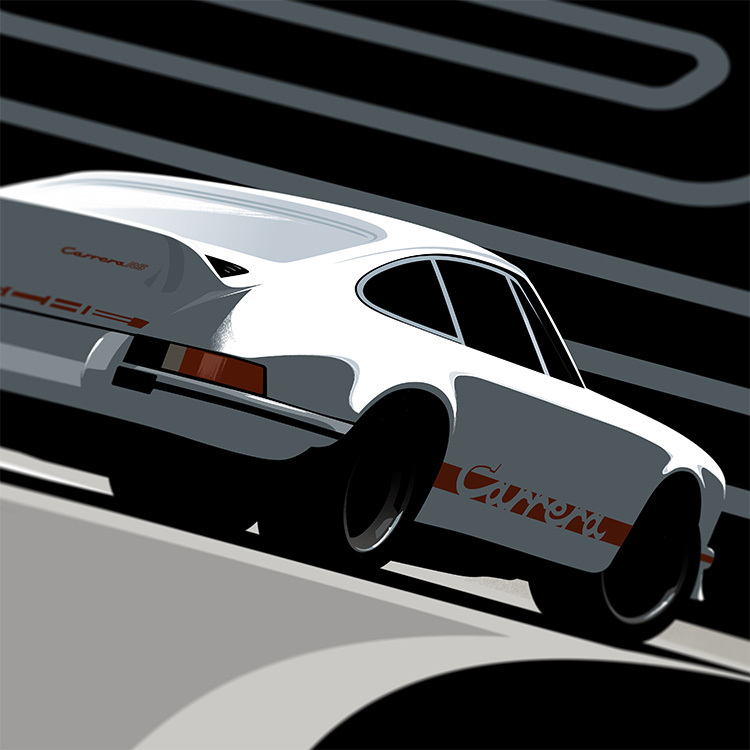 Even in a relatively simple scene, he’s managed to capture the route’s essence with just a few lines and colors; in the foreground we see the churned snow gone grey with exhaust and lit with a bank of rally lights, and in the background we get an abstraction of the road further along the way, ascending into the darkening sky, hugging a lonely peak. 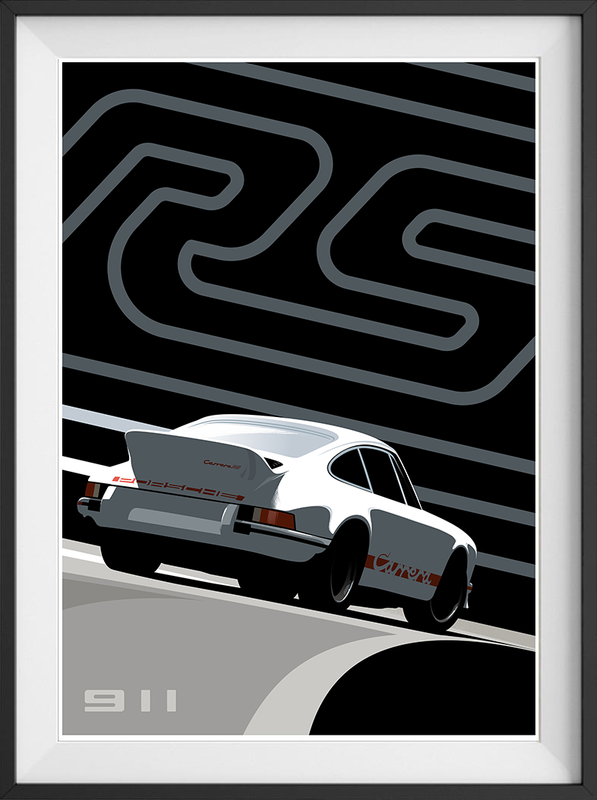 Crisply upright and Teutonic in color palette, but embodying the groovier element of the early-’70s with the script and of course the shape of the car that has become a pop culture icon, Guy Allen’s treatment of the beloved 2.7 RS does justice to the machine that gave birth to a line of brilliant lightweight 911s in its wake. 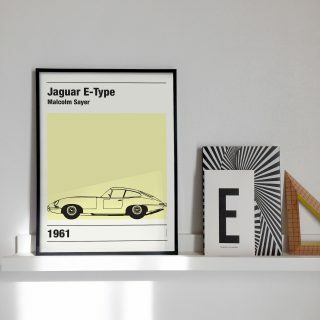 Though so often festooned in Easter egg hues—Signal Orange, Viper Green, for instance—his choice of a simple white and red scheme puts the focus back on the shape of the car. We love the rainbow options as much as the next guy, but they can take attention away from the car wearing them, and this almost monochromatic rendering of the RS ensures that the focus is on the form and not what color it’s painted. 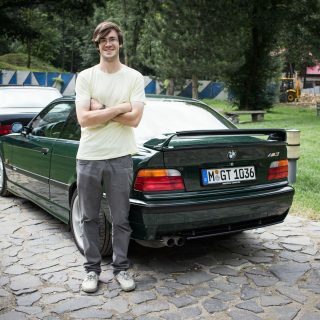 The perspective Guy’s taken is also in service to the shape of the machine, with the rear quarter angle showcasing the augmented haunches and the definitive ducktail wing. 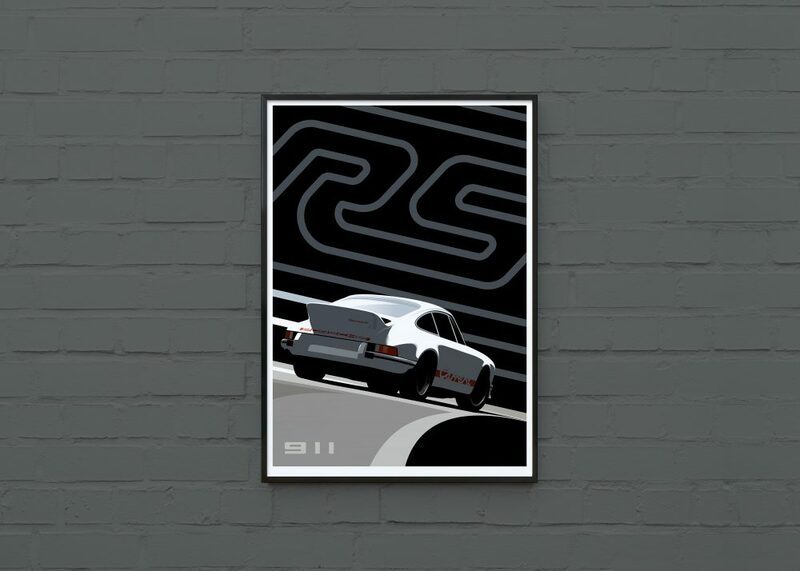 The low angle and slight leftward lean of the Porsche evoke the beginnings of the end of traction, and the stylized “RS” script in the background adopts a similar dynamism by angling in line with the car’s plane. 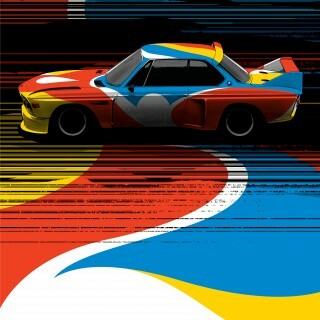 The result is both very austere and playful, an artful blend of stoic anti-color and playful Porsche-like movement. 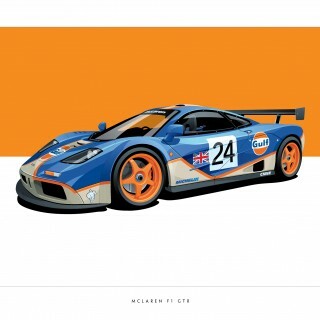 Both posters are limited editions, with just 200 signed and numbered prints produced.